Zinara Rathnayake grew up in Kandy, Sri Lanka. 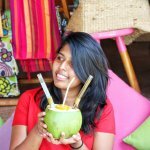 She is a freelance writer, Humanities student and a travel blogger at NatnZin. She tweets @Zin10SantaFe.